**BCG & Charging Handle Not Included. Barrel: 10.5" 4150V Chrome Moly vanadium steel barrel, Nitride treated and chambered in 5.56 NATO with a 1 in 7" twist. This carbine-length gas barrel is finished off with a PSA 12" Slant End M-Lok Rail, a low profile gas block, and a PSA Fluted Flash Can. Simple—Fast—Effective—Point and Shoot. When you boil it down, those are the advantages of a red dot sight. And that’s what the SPARC AR delivers - all in a durable, lightweight, compact, and ultra-clean package. Digital rear-facing controls for power and dot brightness offer quick access and are viewable from the shooting position. 2 MOA dot diameter promotes a precise point of aim and automatically returns to last dot intensity used when powered up. Unlimited eye relief and parallax free, the SPARC AR gets shooters on target fast. The SPARC AR is waterproof, fog proof and shockproof for ultimate durability. Unit automatically shuts off after 12 hours to prevent accidental battery rundown and operates using a common AAA battery. Duty rifle, home defense, recreation, the SPARC AR is built to handle all your red dot needs. • Fully Multi-Coated ‒ Multiple anti-reflective coatings on all air-to-glass surfaces increase light transmission. • Bright Red Dot ‒ Display is highly visible in daylight. • Brightness Settings ‒ Provides 10 variable illumination settings—the lowest two settings are night-vision compatible. • Nitrogen gas purging with o-rings-seals delivers fog proof, waterproof performance. • Waterproof ‒ O-ring seals prevent moisture, dust, and debris from penetrating for reliable performance in all environments. • Shockproof ‒ Rugged construction withstands recoil and impact. • Hard Anodized Finish ‒ Highly durable low-glare matte finish. • Operating Temperature ‒ Rated from -4 degrees to +158 degrees Fahrenheit. • Multi-Height Mount System ‒ Includes a spacer shim that can be utilized to provide two different mounting heights: lower 1/3 co-witness (40 mm) & absolute co-witness (37 mm). • Non-critical eye relief for rapid target acquisition. • 12-hour battery power with an auto-shutdown feature to maximize battery life (typical battery life is 300 hours at maximum brightness and 5,000 hours at minimum brightness setting). is the gas block pinned or screwed on ? What is the overall length of this upper? 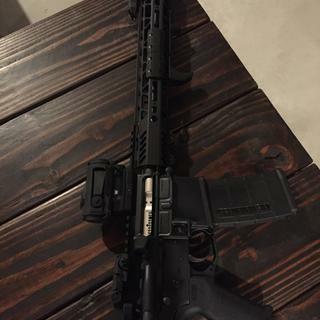 Can I use any pistol lower with this upper? Quality Pistol upper for a price that makes you feel like you just won the lottery. 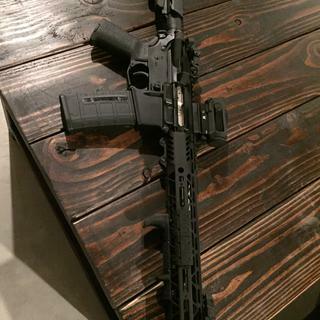 Ordered this upper on 4/16/2019 and received it on 4/20/2019, fast shipping if you ask me. Upon opening the box and inspecting the pistol upper I found no blemishes that other people sometimes speak of. I had zero issues fitting this upper to my stag lower. The pistol function checked properly. Took it to the range and put 250+ rounds through it without zero issues. Overall I would say that I feel as if I am a thief, I got $275+ worth of optics/iron sights for $50. Highly recommend this company to anyone looking for a quality AR/AR Pistol on a budget.